Willowbrook Cottage is a single-storey cottage in Askill, County Leitrim. This welcoming Askill cottage is ideal for couples, and with both an open fire and solid fuel stove, is warm and cosy throughout the year. The cottage has a double bedroom, a shower room, a kitchen and a sitting room with dining area. Outside is off road parking and an enclosed lawned garden with a stream running alongside. 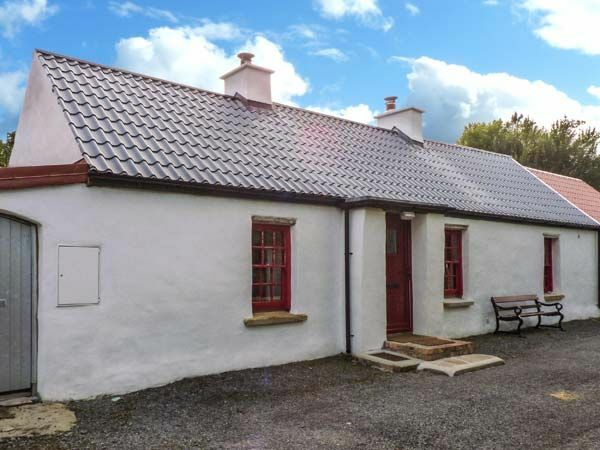 Willowbrook Cottage is well-placed for enjoying this part of Leitrim, as well as Donegal and Northern Ireland. Amenities: Electric storage heaters with electric heater, open fire and solid fuel stove. Electric oven and hob, microwave, fridge, freezer, dishwasher, TV with Saorview, DVD, selection books and DVDs. Electricity and starter pack for fire and stove inc. in rent. Bed linen and towels inc. in rent. Ample off road parking. Enclosed front lawned garden with small woodland, stream, furniture and BBQ. Sorry, no pets and no smoking. Shop and pub 5 miles. Lough Melvin 10 mins walk. Note: There is a fenced stream in the garden, children to be supervised at all times. Note: Max 2 guests including infants. Town: The village of Askill in County Leitrim is very close to the border with County Donegal, including the town of Bundoran, and also close to the UK border into Northern Ireland. Electric storage heaters with electric heater, open fire and solid fuel stove. Electric oven and hob, microwave, fridge, freezer, dishwasher, TV with Saorview, DVD, selection books and DVDs. Electricity and starter pack for fire and stove inc. in rent. Bed linen and towels inc. in rent. Ample off road parking. Enclosed front lawned garden with small woodland, stream, furniture and BBQ. Sorry, no pets and no smoking. Shop and pub 5 miles. Lough Melvin 10 mins walk. Note: There is a fenced stream in the garden, children to be supervised at all times. Note: Max 2 guests including infants. A taste of Ireland that no one should miss! Myself and my companion wanted a quiet place in the country where we could get away from the big cities and the tourist traps. Willowbrook Cottage was exactly what we wanted and more! Our gracious host was there to greet us and explain the finer details of the cottage and left us a wonderful welcome basket that was totally unexpected. The cottage was comfortable, warm and well equipped with everything that one would need to cook and enjoy meals. Every detail was anticipated by the owner. A car is required to stay at the cottage as it is rather isolated. I would also recommend a GPS system as it could be a bit taxing to locate but once you are there, you may not want to leave - we didn't! We did not miss wifi - that is what we were on vacation from! If required, one can go into Kinlogh, a short drive away, to access the internet. I would recommend Willowbrook Cottage to anyone who would like to fall in love with Ireland.